Days before strict gun laws begin in their state, many Marylanders flocked south. The Dulles Expo Center in Chantilly, Va. hosted a gun show Friday evening, selling many weapons and magazines Maryland residents will not be able to purchase starting Oct. 1. 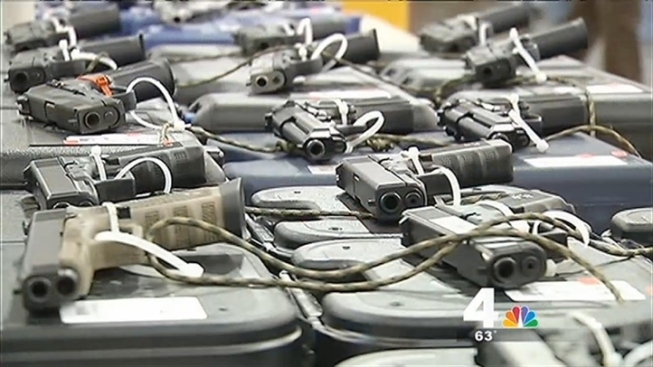 The bill requires people who buy a handgun to submit fingerprints to Maryland State Police. It also bans dozens of assault-style weapons, but those who owned the weapons before the law goes into effect will be allowed to keep them. The bill also bans 20-round magazines. Marylanders, like Elgin Fontaine, trekked to Chantilly. Fontaine bought an AR-10 assault weapon, one of the 45 of its kind that will be banned in his state beginning Tuesday. "The ban is going to wipe out a lot of guns, and this particular style of gun I have is going to be banned," Fontaine said. Maryland Gov. Martin O'Malley released a written statement through his spokesperson saying, "The vast majority of Marylanders support these commonsense efforts to reduce gun violence. The new law will take effect Tuesday and it will make families safer." Debbie Burton, a gun rights supporter doesn't agree with the governor. "I think they're hurting the wrong person by changing the laws," she said. A hearing challenging the new gun laws is scheduled for next week.